Whoa. It’s the word the Consumer Technology Association (CTA) frequently uses to describe CES. For the last 50 years, the show has propelled the evolution of technology by fostering innovation and collaboration among some of the tech industry’s brightest minds. And after spending two days in Las Vegas racing around the world’s largest trade show (held this year Jan. 5-8), we’d have to concur with the CTA’s characterization of the event. 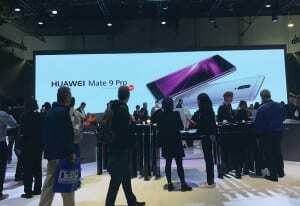 Boasting more than 175,000 global attendees and 3,800 exhibitors occupying 2.6 million net square feet of space across Sin City, the 50th anniversary of CES was a record breaker. Whoa, indeed. 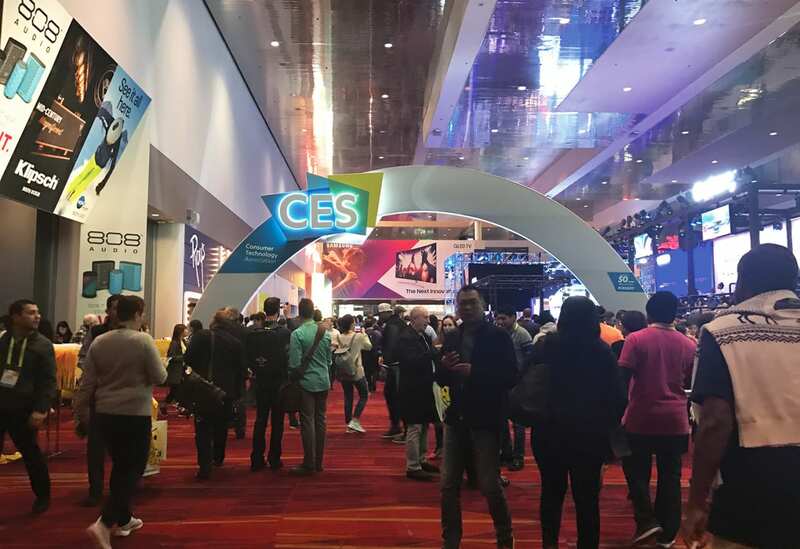 If the booth experiences and technologies on display at CES are any indication of where engagement in the event industry is headed this year, we have one word for you: smart. Connected city environments, smarter robots and drones, and voice control everything dominated the floors. 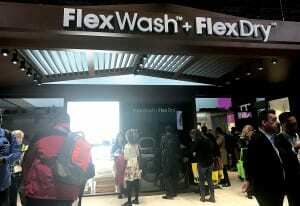 Then there were the not-so-techy event features that gave us pause: the on-site Mamava breastfeeding suites (thumbs up, CTA) and what can only be described as the wellness “parks” of massage chairs clustered on the show floor. We came for design, we came for engagement, we came for the experiences, and brands of every variety were on their A-game. To capture it all, we braved the unseasonably cold weather in Vegas, and according to our devices, walked 18 miles in 48 hours—so you didn’t have to. The best of CES 2017 awaits. We dare you not to whoa. 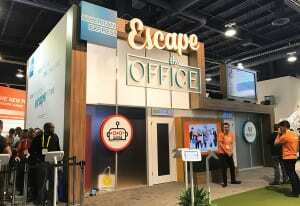 “Escape the Room” events are having a moment and American Express OPEN offered its own take on the phenomenon with its “Escape the Office” experience. Tablet kiosks spread around the footprint gave attendees the opportunity to sign up to participate while simultaneously entering a sweepstakes to win an American Express gift card. Partakers were organized into small groups and given seven minutes to escape one of two “offices” by collectively solving a series of puzzles. Onlookers could watch as a countdown clock ticked away over the entrance to each room, and a digital leaderboard kept things competitive. Natural design elements like turf and overflowing plants created an inviting environment that made wait times less painful. Agency: Momentum Worldwide, New York City. File this one under “most intriguing.” Electric vehicle startup Faraday Future caught our attention from across the show floor with a hanging screen installation that looked like a patch of blue sky hovering over the brand’s footprint. Up close, the booth was just as mysterious. 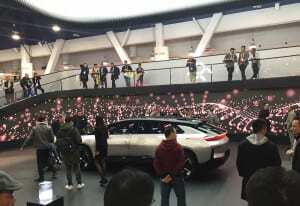 A futuristic looking SUV (the brand’s FF91 model) sat at the center of the space as abstract designs danced around a video wall behind it and ethereal music played in the background. Perhaps the most alluring aspect: a spacious balcony at the back of the space that rose high above the booth, providing panoramic views and a VIP vibe. Signage was absent save for a single logo, but given the allure of the space, we’re guessing attendees were quick to discover the face behind the mask. Build: Pinnacle Exhibits, Hillsboro, OR. 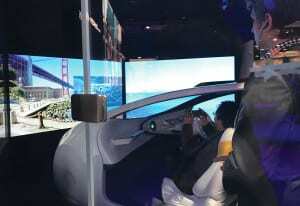 One of countless brands showing off driverless concept cars, Toyota distinguished itself from the rest with an interactive driving simulation. To highlight the features of its Concept-i smart vehicle, which tracks the driver’s emotions and awareness levels, the brand leveraged the car’s facial recognition technology. As participants embarked on a virtual ride, the technology measured their emotions and made in-vehicle adjustments accordingly. Nearby, an “emotion map” combined the emotion data and location information of all participants and aggregated the results. Our favorite part: the spectator-friendly glass cube that encased the engagement, providing clear views of the action and generating a little hype along the way. 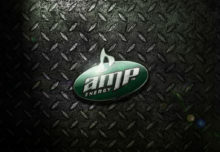 Agency: George P. Johnson, Auburn Hills, MI. Samsung commanded attention with a booth that didn’t allow for a casual breeze-through. Instead, massive black walls concealed the space, creating limited points of entry and likely stirring up plenty of curiosity outside. 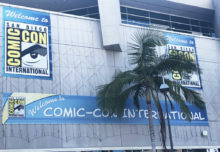 Inside, the footprint was divided into product zones, from connected home appliances to TVs to a gamer vignette featuring a live demo of the Quantum Dot gaming monitor. Towering transparent screens in the form of walls and pillars, along with neutral tones, created a sophisticated atmosphere befitting a large-scale technology brand. And just beyond the product zones, a dark theater lured attendees in with a colossal QLED screen that cast out vibrant imagery (that stained-glass image had us hypnotized). Good overall flow, but we say ditch the walls and let attendees spend their time playing with products, not locating a booth entrance. Design/Build: Czarnowski, Chicago. Operating under a “Cooperative Mobility Ecosystem” theme, Honda’s booth felt like a glimpse of the future. AI, robots and vehicle prototypes—and corresponding demos—abounded inside the open footprint. Of course, nothing grabbed our attention like the brand’s personal mobility vehicles, dubbed “UNI-CUBs.” The scooter-like vehicles had attendees (and brand ambassadors) zipping around an enclosed rink, drawing plenty of eyeballs along the way. Meanwhile, the Honda Safe Swarm experience, located in a dark, intimate room, immersed attendees in a digital engagement that illustrated a world where vehicles communicate with one another to support drivers. Leveraging partnerships forged under the Honda Xcelerator incubator program, the brand also offered co-branded experiences, including a VocalZoom engagement in which optical sensor technology read attendees’ facial skin vibrations as they spoke, then isolated their words from other voices and background noise. A little too cluttered for our taste, but the engagements made up for it. Agency: George P. Johnson. In a sea of black and white, Polaroid’s colorful booth was a breath of fresh convention center air. The brand celebrated its 80th birthday in style with a whimsical, vibrant booth featuring playful photo collages, a large video wall (who knew Polaroid was a TV brand? ), dark woods, modern lounges, color-coded meeting rooms and even its own virtual reality zone. A 3D printing station and myriad product displays offered plenty of opportunities for hands-on engagement, but we couldn’t have looked away from the brand’s carousel installation if you paid us. 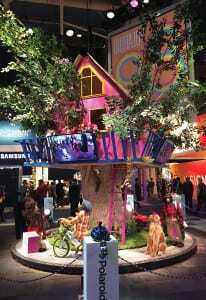 Anchored by a bright pink tree house, the spectacle featured a real rotating carousel occupied by an assortment of quirky characters, including several well-dressed monkeys. The display was designed to promote the Polaroid Cube+ camera by illustrating that the device can be mounted to just about anything—like a monkey’s suspenders. Nearby, a (very patient) model wearing all white was perched on a small platform surrounded by bottles of paint. Attendees who passed by were encouraged to turn him into a work of art by decorating his clothing with the colorful paint—one of the most creative, analog engagements we witnessed at the show. Build: Skyline Exhibits, St. Paul, MN. Where to begin? Panasonic’s “A better life, a better world” mantra permeated every inch of its gargantuan footprint. 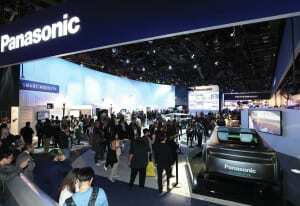 A series of lifestyle vignettes offered a glimpse at Panasonic’s vision for the connected homes and cities of the future, and were categorized into themes like smart entertainment, healthy lifestyle and connected vehicles. Other features: Transparent screen prototypes that turned windows into visual engagements and signage, flags with video images and sound that reacted to their movements, a 3D model that used projection mapping to illustrate the flow of smart cities and a 360-degree Ballooncam that hovered over the show floor and shot panoramic 4K footage in real time. A replica New York City subway with live actors was never without an audience. We liked the oversized schematics that corresponded with each zone, which balanced the high-tech atmosphere with a hint of analog. Design/Build: Czarnowski, Chicago. 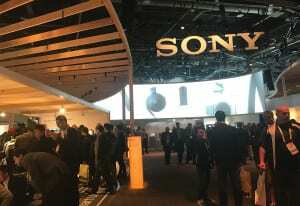 Sony ditched its ultramodern look for a more natural aesthetic this year and it was exactly the facelift the booth needed to balance out its vast array of tech offerings. Featuring sleek overhangs made of natural wood, smooth lines and spacious product displays, the footprint was warm and welcoming. Like many other top brands, Sony transformed its booth space into a smart home of sorts, demoing many of its products inside cozy spaces designed to look like living rooms (right down to a half-played Monopoly game). A dark room engagement for the new Sony a7 camera (with a brand ambassador who clearly knew her stuff), a stage for product presentations, a wood-framed listening pod to test out noise-cancelling headphones, a Dolby Atmos sound bar, a live scarf dancer, short throw projection demos and a PlayStation virtual reality zone were all part of the experience. Whew. And with a space strategically designed for all the action, the free-flowing footprint allowed attendees to take it all in without spouting any four-letter words. Build: In-house. LG, you old son of a gun. We knew the electronics giant was a hard-hitter, but this year’s booth was off the charts. 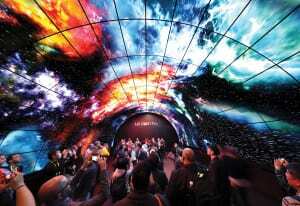 If it came down to naming the best one-off experience at CES, the brand’s OLED Tunnel would take the cake—hands down, no questions, see ya later. 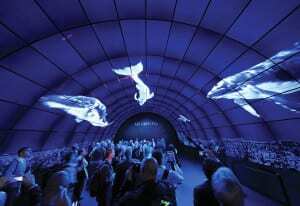 Featuring ambient sound powered by Dolby Atmos and 216 interconnected 55-inch OLED panels, the immersive tunnel experience enveloped attendees in the sights and sounds of nature, from a deep-sea encounter with whales to a cosmic space odyssey. It was a sensory journey unlike anything we’ve seen—so much so that most viewers couldn’t help but clap at the end of the sequence (ourselves included). The remainder of the space was brimming with, what else, lifestyle vignettes. A favorite was the smartThinQ home appliance zone, which featured playful displays of home-cleaning robots. Also on offer: VIP tours, a mesmerizing art installation featuring dancing orbs (demonstrating display nanoparticles), photo demos featuring a live band, a massive rotating OLED pillar delivering brand messaging and a sound bar. What can we say, LG? “Life’s Good” when you have a badass booth. Design: HSAd Agency; Build: The Taylor Group, Boston. Go on, admit it. You knew which brand would snag the number one spot. 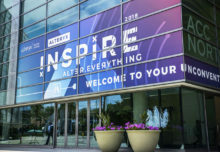 Equipped with a 12,000-square-foot space on the ground and an upper-level executive lounge spanning 5,000-square-feet, the tech giant had plenty of room to implement its brand themes—smart, connected, immersive—and they shone through at every turn. 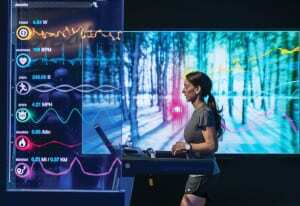 A wearables zone featured two pro athletes working out on a treadmill and a stationary bike, and as they moved, two nearby screens showed their biometric data in real time (athletes rotated throughout the day). Similarly, a designated zone that served as either a basketball court or baseball field, depending on the time of day, had both pro athletes and attendees shooting hoops or taking swings while sporting Intel’s wearable Curie chip. Gaming stations, two low-key virtual reality zones (private rooms for the goggles, a premium, private departure from most VR activations on the show floor) and a central stage area featuring stadium-style seating were also part of the experience. (“We try to avoid ‘demos on a stick,’” Victor M. Torregroza, program manager-event strategy and production at Intel, told us.) Warm lighting, transparent screens and well-defined sound in each corner of the booth added to the ambience. In addition, a partnership with BMW offered a compelling connected city experience through the Microsoft HoloLens, which used augmented reality to showcase the technology Intel will use to power automated driving on one of BMW’s autonomous concept vehicles. Oh, and did we mention how kickass the brand ambassadors were? Kudos, Intel. You make it look easy. Agency: LeadDog Marketing Group, New York City; Build/Design: The Taylor Group, Boston. 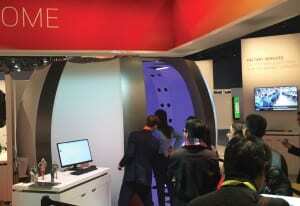 Canon’s 3D printing engagement, created in partnership with Solidiphy, had attendees lined up at all hours of the day. After signing up for the experience at a tablet kiosk, participants stepped inside a spaceship-esque structure to have their 360-degree image captured. After receiving a proof of the image via email, attendees could opt to have their likeness 3D printed and shipped to them for a fee. We viewed a few samples and determined the engagement was well worth the wait. 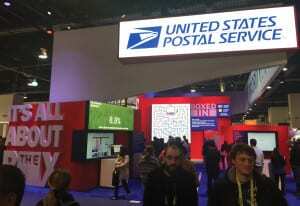 The United States Postal Service at CES? Yep. To promote its new Precious Cargo Box, the USPS activated a two-player PAC-MAN-style game called Boxed In that had players racing through a maze collecting packages. Played on a giant screen, the engagement was accompanied by a digital leader board to give onlookers a taste of the action—which was pretty fierce, given the grand prize was a shiny new camera drone. Oversized text, striking red and blue tones and a mosaic of screens also made this one hard to miss. With a smart mix of digital and analog, American Greetings made a memorable debut outside the Las Vegas Convention Center in a quaint glass-encased structure . The brand’s artists, creators and illustrators were on hand to showcase the technology they use to create new card designs via live illustrations on a Cintiq machine. 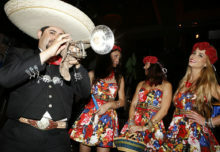 Additionally, attendees could create their own cards while making a 30-second video of the experience to share socially. Our favorite aspect: a transparent mailbox set in the center of the space where attendees could snail mail cards they designed on-site. Agency: MullenLowe, Boston. Set inside a mysterious black structure, IBM’s activation was based off of the film “Hidden Figures,” which follows three little-known female mathematicians who assisted NASA in the 1960s. (To promote the film, IBM placed hidden figures all around the country, only to be discovered through an augmented reality-based mobile app.) 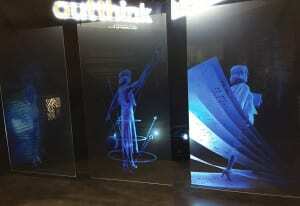 CES attendees were encouraged to download the app then scan a large QR code above an on-site statue of one of the women to uncover her history. The rest of the space functioned as a virtual museum of sorts, with three screens filled with 3D graphics, text and video telling the story of these “Hidden Figures.” Agency: TH Productions, New York City. 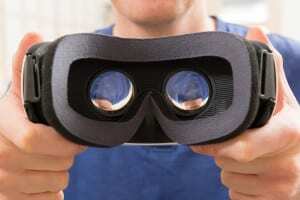 Institute of Electrical and Electronics Engineers’ (IEEE) “Univrse” exhibit included a multi-user VR experience that transported participants into a virtual museum where they were encouraged to interact with and pick up specific objects. The tour also included a virtual curator who provided the history of each artifact. 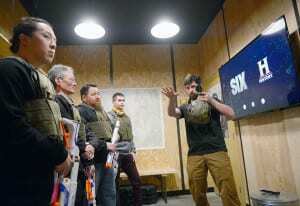 HISTORY brought its new drama series “Six” about the world of Navy SEAL Team Six to life with a “Night Vision Ops Training” booth outside the convention center that had participants navigating physical obstacles, taking on visual challenges and completing combat missions in total darkness. The tie to technology? They did it using the same night vision technology as the Navy SEALS. The bunker-style activation caught our attention—the press event held in the dark to open the show, sealed the deal. —R.K. We saw natural design elements incorporated into Sony, Polaroid and American Express’s booths, but some lesser-known brands also took the theme and ran with it. With one of the most stylish booths at the show, Belkin went with an au naturel motif featuring hanging garlands in its Linksys zone, a living succulent wall and reclaimed wood flooring. Goal Zero, a portable solar-power products retailer, brought the theme to a new level with tree stumps that served as tables, lush plants in every corner, chairs and product display tables made of earthy materials. Electronics company Changhong was another standout in this category. 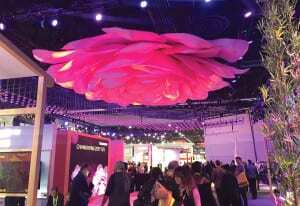 At the center of the brand’s booth, an enormous pink lotus flower hung from the ceiling. A hanging display of translucent, flower-themed banners, as well as live plants, Zen-like planters filled with tiny pebbles (that somehow didn’t get all over the floor) and deep purple and magenta hues completed the look. You couldn’t take a step at this year’s show without running into one type of LED screen or another, but what caught our attention were the vast amount of transparent displays. 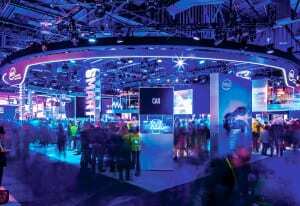 Intel leveraged them in the “connectivity” section of its booth to show off its automated driving technology. Samsung’s footprint also featured the screens, in all shapes and sizes, to digitally demo its home appliances. 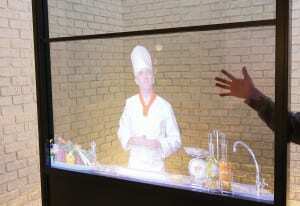 And in Panasonic’s kitchen vignette, the display presented a chef who offered relevant cooking instructions. 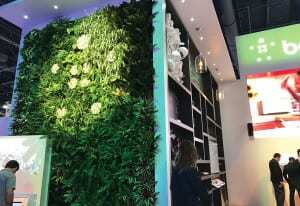 Everywhere we turned at CES were big, bold LED displays, offering color and movement and in many cases, serving as booth walls. At the Sands Convention Center, Under Armour’s colorful booth and towering screen display gave athletes a larger-than-life appeal (Agency: George P. Johnson). Large, tiled LED screens lined the top of Go Pro’s booth, adding a pop of color and dramatic Go Pro content against the crisp white booth design. Nissan and Huawei both incorporated wide screens to serve as animated backdrops to their booths. —R.K.